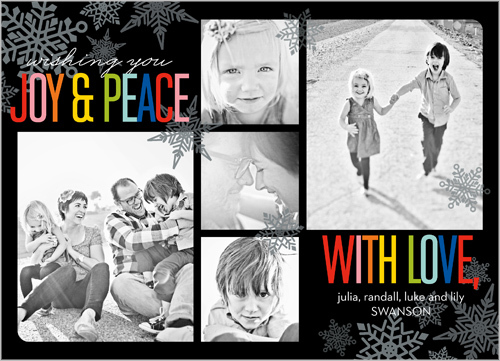 Holiday Cards from Shutterfly-Sponsored Post with Giveaway! Christmas is one of my very favorite times of the year. Since Ed and I got married, I’ve delighted in sending cards every year to our family near and far. Since having kids, I’ve really enjoyed sending photo cards. 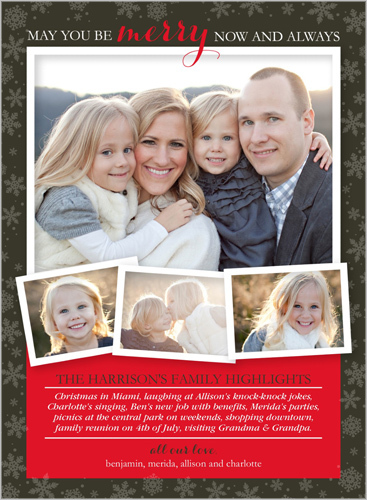 It’s a fantastic way to send a snapshot of our family and show off how the kids have grown through the year. 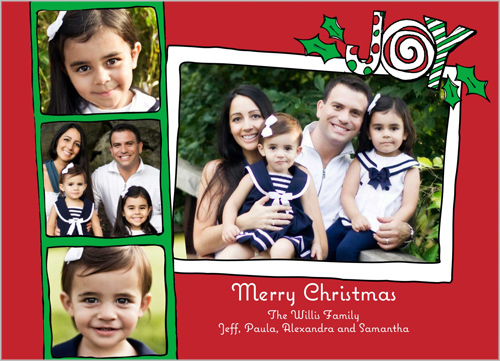 For as long as I’ve been sending them, my Holiday Cards have come from Shutterfly. Whether you want just one photo, a few, or an entire collage of photos, Shutterfly has the Christmas card for you. I start planning my cards in October or November, just to give me time to play around with all of the options they offer. Once I find the perfect card, it’s easy to be on my way. I just add my favorite photos, crop if necessary, add our Christmas message, and just like that, I am on my way! It could not be easier. Once I’ve placed my order, the cards and envelopes are in my hands within a few days and I can begin the hard work–addressing them all. My favorite photo cards give me room for a picture of my 3 kids together, and an individual shot of each one. You can see how you can’t really go wrong with Shutterfly. I’m already eyeballing cards for next year when we’ll have photos of 5 kids to contend with! Now for the fun part! First, be sure to check out Shutterfly’s Special Offers page. This page shows you all in one spot, all of the discounts and deals Shutterfly has going on. Second, are you interested in giving Shutterfly a try? Shutterfly has offered me a promo code for one lucky reader to receive $50 off an order of $50 of more (excluding tax and shipping). To enter, leave me a comment below telling me one of your favorite Christmas or Holiday traditions. The Giveaway will close on Tuesday, November 13, 2012 at 11:59PM Eastern Time. I am pleased to have been asked to host this sponsored giveaway from Shutterfly for the third year in a row. In return for this post, I am being given $100 off of my own card order, so I’d like to give a great big thank you to the folks at Shutterfly. Honestly though, even without the offer, I’d be purchasing my cards from Shutterfly, and telling anyone who would listen. Posted in Christmas, compensated review, nablopomo. Bookmark the permalink. I use Shutterfly, too and am very happy with them. I love doing photo cards for Christmas. The hardest part is picking the “perfect” card … they have so many choices! My favorite holiday tradition is waiting for everyone to wake up Christmas morning before going downstairs to open presents, and then opening them one at a time. Or maybe it’s the fact that we have a lazy breakfast and stay in our PJs most of the day. Yup, that’s my favorite tradition. Favorite traditions: eating candy out of my stocking at my mom’s house for breakfast, and eating homemade soup for dinner at Jim’s parents’ house. My favorite Christmas tradition is lunch and dinner with our families. I love decorating the X-mas tree. My favorite tradition is exchanging gifts with family and friends. Celebrating my daughters birthday. She is a Christmas baby. First of all, Shutterfly is one of my favoritest things ever. 😀 My favorite Christmas tradition used to be getting together with my mom’s extended family at my grandma’s house. Polish food, presents, hockey, lots of singing and laughter…it WAS Christmas to me. 🙂 Now that she’s gone and I have a family of my own, I really can’t pick just one favorite thing. I love all of Christmas with my husband and kiddos, and both his family and mine. One of our fave traditions is watching the Christmas carol movie and drinking hot cocoa. One of my favorite traditions is, even though we spend most of the time running around to see family, we always spend a few hours Christmas morning in our own house.